Our regional AGC CM Lean professionals are members of the LCI community of practice in the areas in which we serve. PLAN—to identify and analyze the problem. DO—develop and implement a solution. ACT—to adopt and/or update the necessary standards, abandon the process change or run through the cycle again. 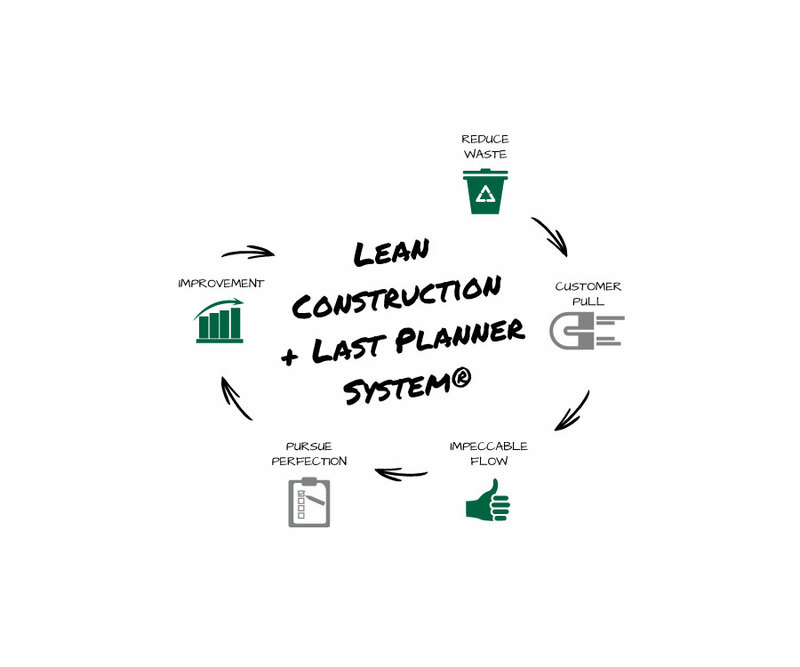 LeChase embraces a lean culture that is centered around collaboration and planning, providing efficient workflow from conception to completion with the elimination of wastes. Our focus is on improving safety, quality and overall value for our customers. We employ 5S+1, just-in-time delivery, no materials hit the floor, The Last Planner System and continuous improvement. Eliminate work waiting for workers and workers waiting for work. Provide predictable and reliable workflow. To remember the 8 wastes, think DOWNTIME. Efforts caused by rework, scrap and incorrect information. Unnecessary movements of product and materials. Producing more than needed or producing too early. Excess products and materials not being processed. Wasting time waiting for the next step in a process. Unnecessary movement or repetitive movements. Underutilizing people's talent, skills and knowledge. More work than is required by the project.